Started on March 1st 2015, the DiViNe project gathers 6 partners to start a new area in vaccine purification, with a €5.8 million financial support from the European Union through Horizon 2020. The partners will adopt affinity chromatography, a potent way to separate one active compound from its environment almost exclusively used for purification of monoclonal antibodies with protein A. Nanofitins® bear all the features to extend affinity chromatography for purification of most biologics starting with vaccines: tailored affinity and elution parameters, easy conjugation to resins, low cost-of-goods… Merck Millipore will develop Nanofitin®-based chromatographic materials and GSK will provide vaccines for purification. Through such demonstration on vaccines, the DiViNe consortium will establish a sustainable platform to design affordable, industry-compliant and environment-friendly purification processes for other complex biological drugs, such as recombinant proteins and blood products. Neutralizing anti-TNFalpha antibodies have been shown highly efficient for responder IBD patients, providing a strong alternative to corticosteroid therapy. 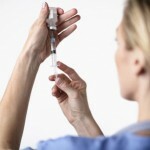 However, debates still remain regarding their use as a first line therapeutic, considering the expensiveness of such therapy at first but also considering immunogenicity concerns and the fact that they are injectable drugs only, which beside the poor compliance can lead to injection reactions or systemic-related side effects (infection, risk of lymphoma.). The extreme stability of Affilogic’s Nanofitins® allowed the generation of new and affordable anti-TNF-alpha therapeutics with a powerful preventive and curative anti-inflammatory action in models of IBD after oral administration. The use of the oral route is expected to avoid systemic-related side effects and Affilogic is investigating this strategy on other targets of interest in GI diseases. Mathieu Cinier, Scientific Director at Affilogic presented the very significant progress made by SADEL consortium in developing an orally available anti-TNFalpha Nanofitin® to treat Inflammatory Bowel Diseases. In vivo evaluation following intrarectal administration showed remarkable anti-inflammatory effects for several Nanofitins® in the TNBS-induced colitis model at the optimal dose of 50mg/ml. The efficacy of the three best Nanofitins® was confirmed on the model of acute colitis induced by DSS. Finally, similar reduction of the inflammation was achieved following oral administration of Nanofitin®-based drugs.